When it comes to grass roots drifting, the ‘Club Loose’ name carries a tremendous weight. Well known across the country, their home track resides in Old Bridge Township, NJ; better known to most as Raceway Park. Setting up dozens of events during the season, Club Loose draws a large amount of novice and experienced drivers alike. It's also frequented by Formula D pros during their off weekends or when they take extended stays around the Formula D circuit stop at nearby Wall Speedway. Level of expertise aside, there's one thing they're all doing - burning through rear tires. Frank, being in the tire industry and a savvy businessman, saw an opportunity to contribute to this community directly. His company, BC Tire, became the provider of tires for the Club Loose events, literally trucking container loads in to feed the addiction at an affordable price. Spending more time at the track as a vendor stirred up the desire to have a dedicated car to go out and enjoy for himself. At the time he had just finished building a show oriented full OEM 1M converted 135 on air ride, but he was looking for something a little more suitable to bash around. He wanted a chassis that was more simplified and rough around the edges compared to the E82. He found himself a very modest, garage kept, 325e owned by an old lady in upstate NY. Underpowered, but a solid chassis for its age, Frank decided to reach out to AUTOcouture Motoring to improve it 'slightly'. This is when I had first met Frank. It was a well over a year ago when he contacted me about this little project he had in mind. He informed me that his intentions were somewhat nefarious, so naturally he had my undivided attention. 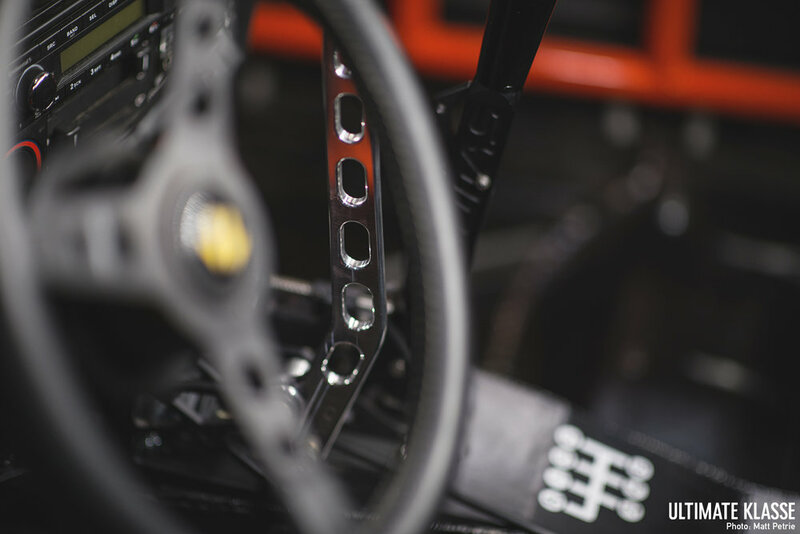 More displacement by means of a factory V8, full suspension conversion, brake overhaul, widened fenders, the list went on and on and the more he explained to me, the more I knew I was going to have the opportunity to be a part of something very exciting. The most enjoyable aspect about this project was that he was building this car for the sole purpose to go out and play with it. Not being an experienced driver, both Frank and the car would improve together. After dozens of emails, the day finally came and the E30 was dropped off. We began stripping the car and preparing it for the transformation. He had a plan in mind for the heart of the project and shortly thereafter he told me he sourced an M60 from California. A couple of weeks later, there was an M60 on the back of the tractor trailer outside of the shop. After a 3,000-mile journey, the tailgate swung open and we come to find it strapped to a pallet on its oil pan solely with the transmission affixed to the valve covers above. A sandwiched M60, sitting naked on it's oil pan was exactly what we didn't want to see. Unsure of the damage done to the internals, I attempted to get a hold a Frank to let him know of our discovery. Unresponsive and in a time crunch from the delivery driver, I was in a pinch. If we signed for it, the mystery package was our problem. If we sent it back with the delivery service, Frank had no engine. Finally after multiple attempts, Frank responds….his wife was in labor....how about that for timing? He gave me the OK to refuse the engine as he was leaning our way of conservatively not rolling the dice. 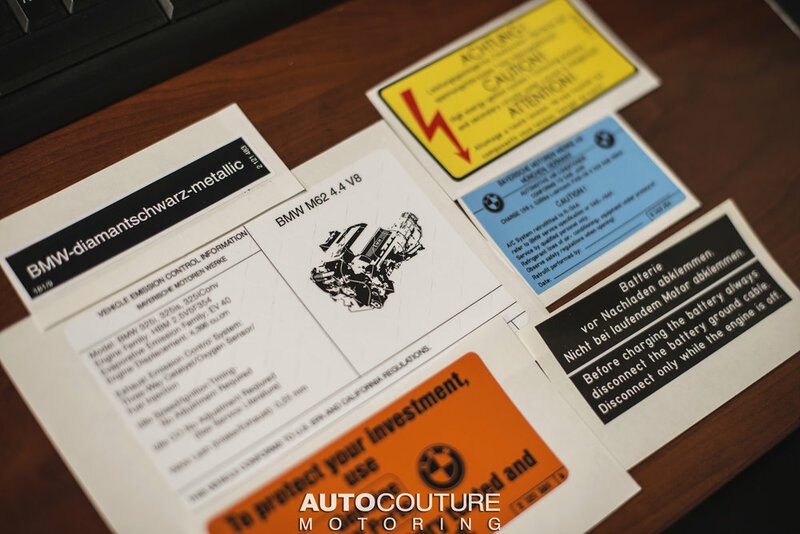 Conveniently however, we had recently finished performing a manual trans swap for a California customer who bought an E39 touring on the east coast. We swapped the transmission weeks before and that customer flew out here to drive the car back to his home in northern California. 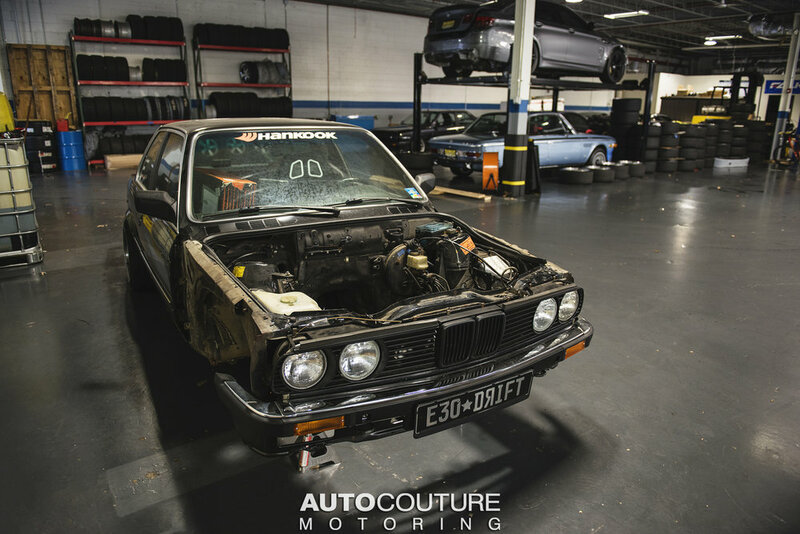 That donor car, sitting outside of the shop, provided the prospect of an M62 that was ready for its new life in a smaller chassis, pending on Frank agreeing to it. As long as the M62 passed leak down and compression test Frank was in. 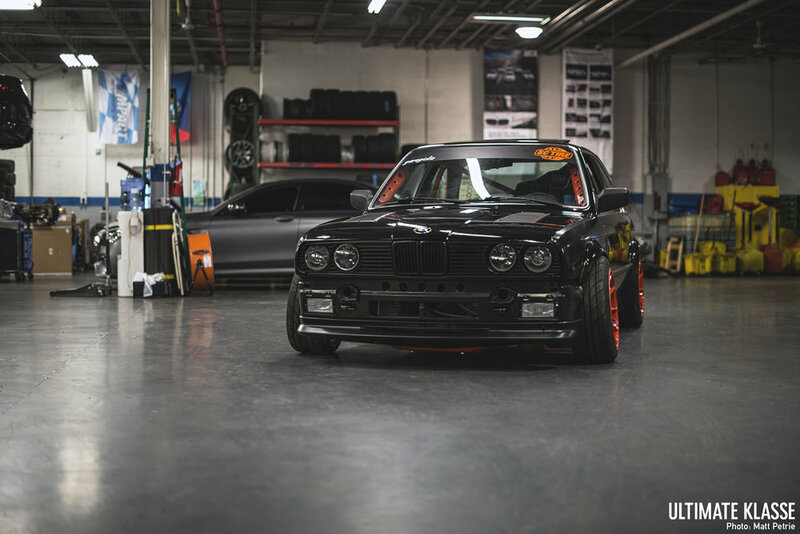 He knew that the weight of the E30 and with the help of a welded differential out back, he wouldn't need to go crazy with an S62 or building out an M60/M62. Instead, while it was out of the car the plan was to focus on the reliability of the engine. We replaced the head gasket, timing chain, timing chain guides, all seals and hardware, full cooling system including water pump and thermostat to name a few. 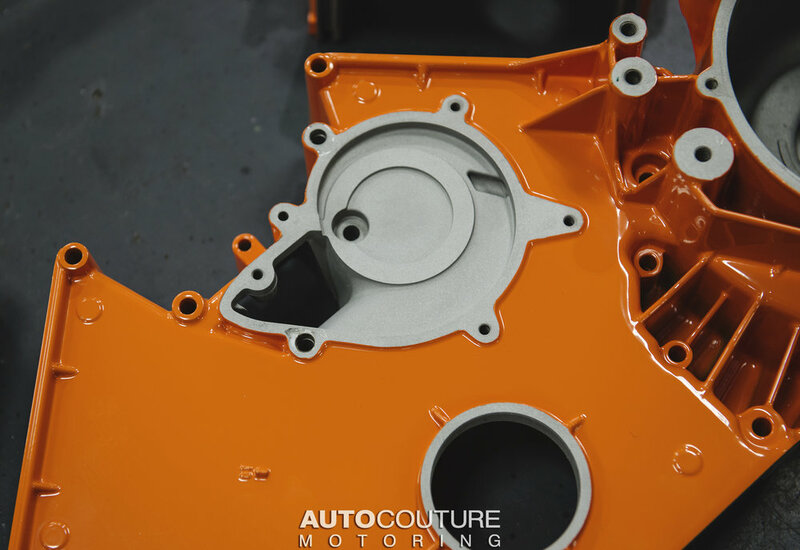 During the disassembly and maintenance overhaul of the M62, many of the engine components were powder coated orange. While the entire shop had a part in the build, the primary mechanic and fabricator behind it was Charlie Cisek. He was able to make all of Frank’s requests a reality and even some things Frank didn't know he wanted. 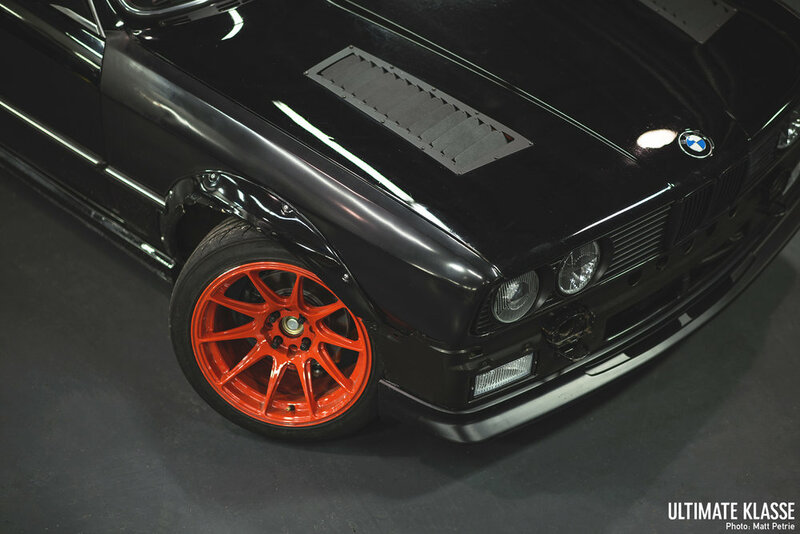 This E30 is littered with details, more hiding around this car than can be mentioned. 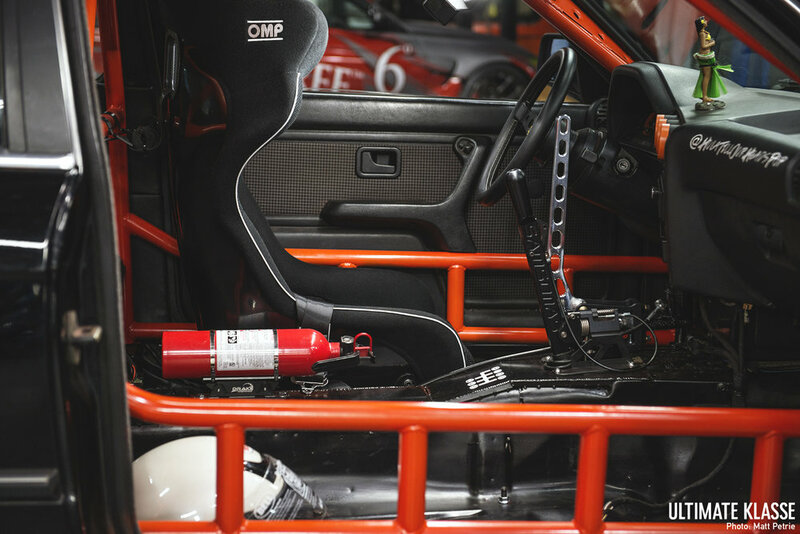 It would be too easy to point out the orange full cage that was designed and made by Charlie, but rather the fact that a nearly 100 percent stock interior still remains with it. Full rear seats, headliner, door cards and functioning sunroof are in tact, even the door card armrests were slimmed down to fit flush above the side bars. Small riveted panels follow the contours of the dash to clean up the cuts made to accommodate the additional A-pillar area. We could mention the floor boards and how they were cut, bent and gusseted individually by hand as well as a dead pedal made from scratch to mimmic the rest of his aftermarket pedal assembly. The reinforced trans tunnel is the backbone for his right hand as the Samsonas shifter and the ASD hydro handle both mount securely there. The force of shifting gears and pulling on the hydro creates too much pressure for the thin sheet metal of the trans tunnel alone, leaving Charlie no choice, but to beef it up with thicker metal. The removal of the center console left no place for the window switches so he relocated them up top on the dash board. With the heat in tact, but air conditioning removed, the 'snowflake a/c' button has been reassigned to power up the auxiliary fan. Amongst the cooling fan, behind the kidney grills lies a power steering cooler and external oil cooler. The source of the oil cooler is a European S62 oil filter housing chosen because of its inlet and return line ports. Charlie showed his affinity for older Japanese cars by exposing the oil cooler lines in the front bumper running from the custom mounted oil filter stand to the cooler itself. 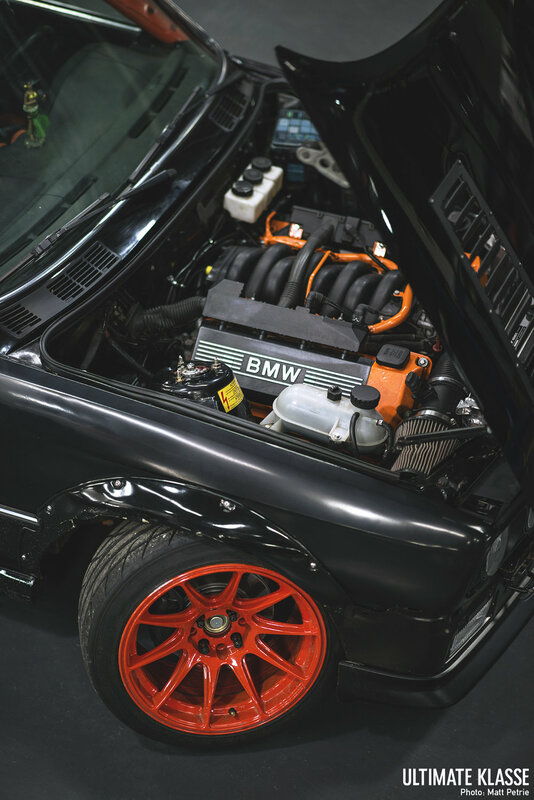 With the removal of the M20 and most of its corresponding components, the engine bay received a minor shave. The lack of room due to engine size, required many of the fluids to be relocated to Chase Bays reservoirs or Wilwood tanks. The wiring was severely slimmed down from the conventional E39 540i. 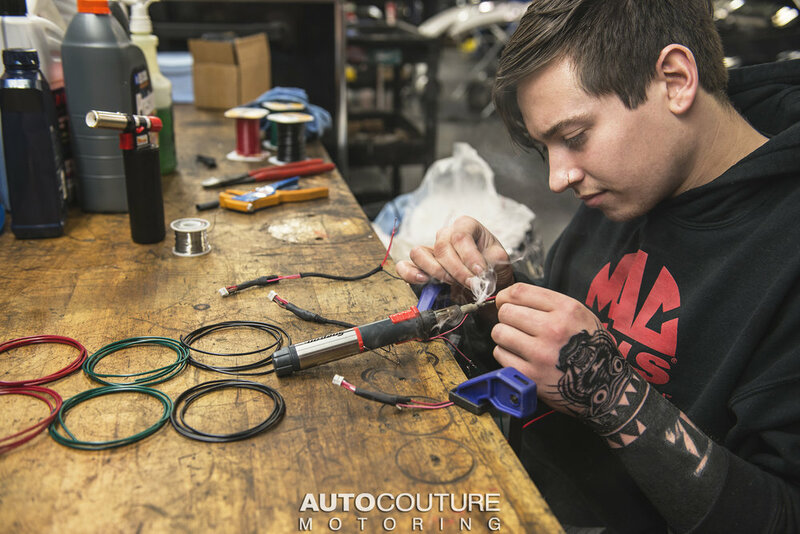 Thanks to the combined expertise of Shaun Bruno, the shop foreman, the harness and connectors were carefully re pinned to utilized only what Frank needed. Along with sorting out the wiring in general, they were able clean the engine bay up further by changing the engine wiring harness location. Typically, the engine harness leads out of bank two, across the engine bay, and into the driver footwell, but instead a block off plate was made in place of the original exit. An access panel was cut facing the firewall and the shortened wiring harness now dumps directly out of the back into the glove box area. To fit the M62 engine, the Garagistic front subframe was used. To fit it properly, the motor mount bracket on the M62 had to be modified slightly to fit. Mounting modification was also done to the transmission well. Charlie fabricated a new transmission mount to hold the 6 speed gear box underneath. The trunk houses the ATL fuel cell on top of the deleted spare tire tray. Below the trunk floor is the perpendicular reinforcement bracing for structural rigidity and is the receiver for the custom made fuel cell brackets. This provides maximum strength to the frame and protects the E30 structurally in case he gives the wall or another car, a love tap. The other item sharing space with the fuel cell is native to the trunk, however has been relocated and reinforced as well. Charlie fabricated a battery tray and shock tower brace to combine added stiffness and for weight distribution, keeping it all neutralized and centered over the differential. With all of that extra room below, Charlie cut an access area in the quarter panel in preparation for the side exhaust. Made to be serviceable in sections, the exhaust comes off the headers with only a couple of resonators in place. The car fires up with a ferocious bark, and although it idles surprisingly quietly, the blip of the throttle is enough to make you jump even while you're prepared for it. 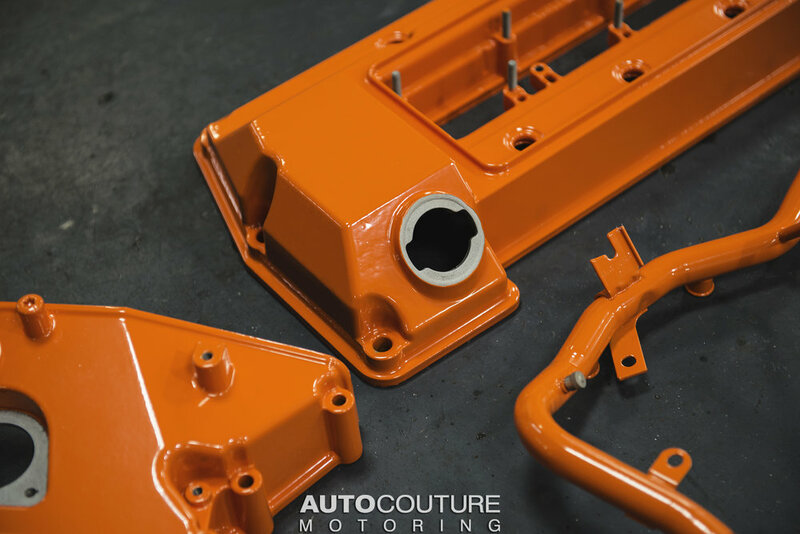 A reinforced and powder coated rear subframe holds a welded 2.91 differential with custom reinforced mounts and upgraded bushings. 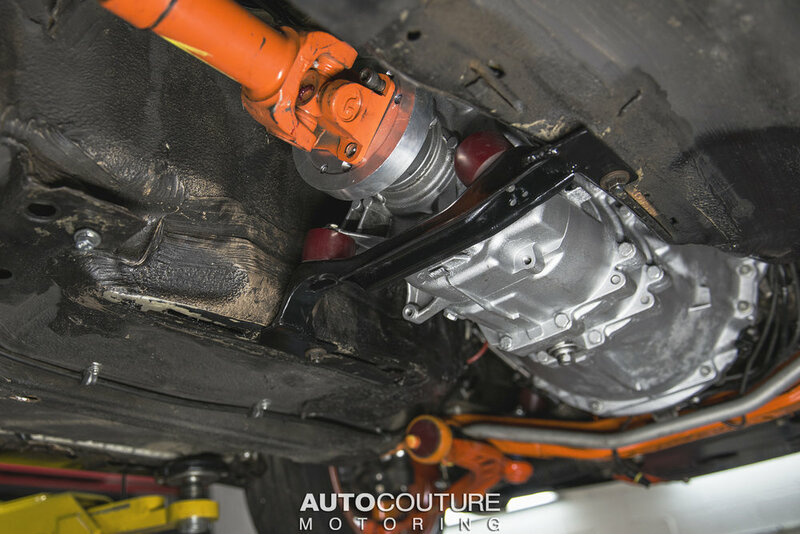 A shortened driveshaft in orange (naturally) accommodates the new length of Kassel tuned M62 to the rear end. CA Tuned coil overs were installed to keep the car flat and planted, bestowing confidence as the car gets tossed from left to right. 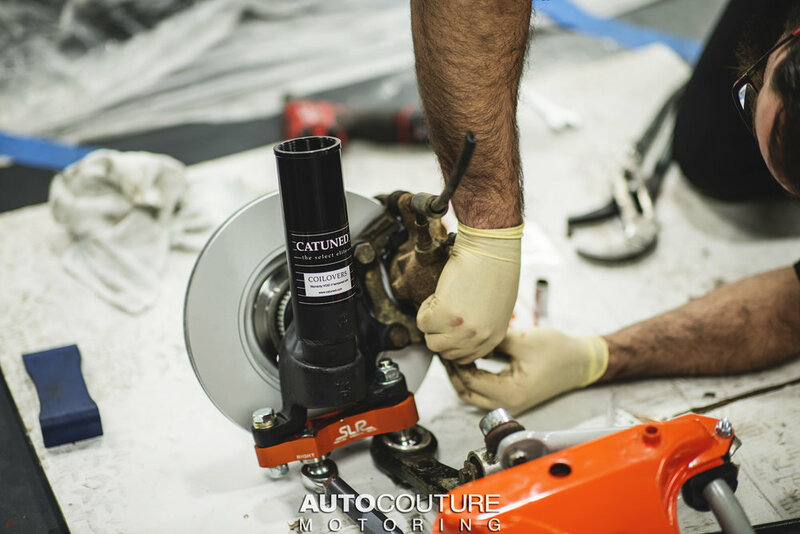 The car has enough torque to throw itself in either direction with the tap of his right foot, but when he needs to lock up the rear wheels, he does it with the help of a Wilwood dual caliper setup. This winter has brought on the second iteration of the M62E30. This season, Frank will continue to get more experience under his belt and push the car further towards its limits. This project is not over as Frank has continued plans for the future, but the important thing is that whether he's locking in lines or breaking it, he's shredding tires and putting a smile on his face. 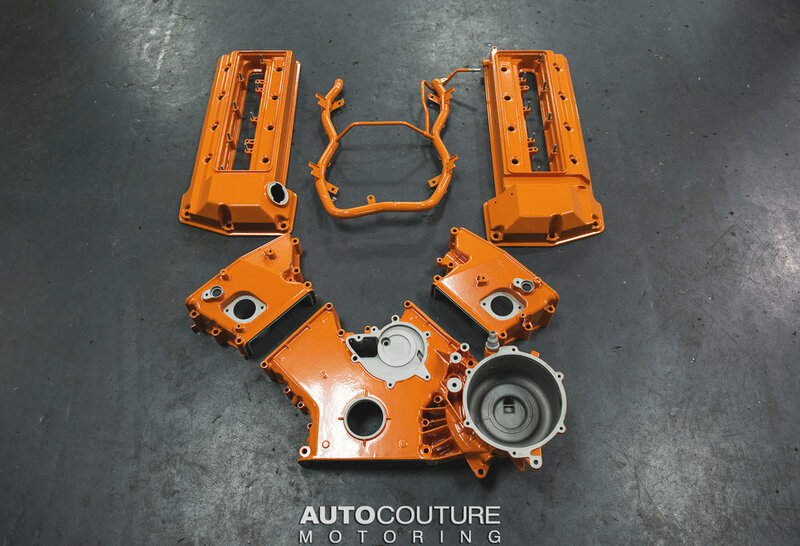 For more photos of the build, click on the gallery below for some of AUTOcouture Motoring's documentation.